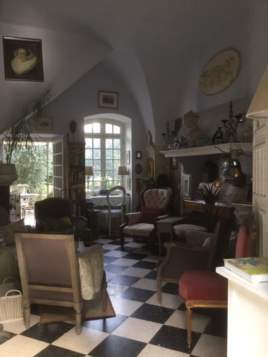 We are very happy to welcome you into our old house in the center of the old part of La Roque d’Anthéron. The bedrooms are decorated in soft gentle colours and have everything for our guests to have a relaxing and comfortable stay. 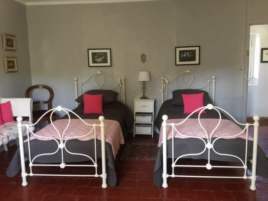 Both bedrooms and shower rooms have recently been renovated. Each guest will be given towels, a pool towel, a nice bathrobe, body wash and shampoo, and there is a hair dryer in each shower room. This bedroom (24.5 sqm) has a king size bed, a daybed, desk, wardrobe, small table and chairs. It has an en-suite shower room, A/C. There is a small balcony with a small table, 2 chairs, umbrella and wonderful views towards the mountains. This bedroom is decorated in soft white/green/sandy colours. 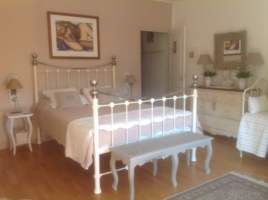 The price is 125.00€ per night for 1 or 2 people staying. A surcharge of 35.00€ per night applies if an extra person stays in the room. A surcharge for the bedding being used for the daybed of 20.00€ per every change (ie if 1 person uses the king bed solely and 1 person person uses the daybed)! Breakfast and tourist tax are both included in the price. This bedroom (24 sqm) has 2 single beds, a daybed, desk, wardrobe, small table and chairs. It has a private separate shower room and private separate toilet. A/C. The room offers wonderful views towards the mountains. This bedroom is decorated in soft pink/white/grey colours. The price is 110.00€ per night for 1 or 2 people staying. A surcharge of 35.00€ per night applies if an extra person stays in the room. Breakfast and tourist tax are both included in the price. NB! Both bedrooms are on the 2nd floor - so not for people who cannot climb a staircase! 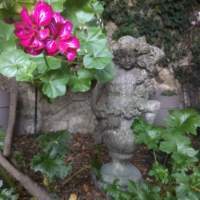 Our guests will be able to enjoy the pool (9m x 4m - not heated) in our lovely little garden, which is quiet and private, full of nice flowers including lavender, a couple of fig and olive trees, a nice fountain, and this is also where we serve breakfast on the terrace between 08.30-09.30. There's also an enclosed shower and a separate toilet outside. Our hall is for our guests to relax in. Our old family piano has found its way into the big fireplace and loves to be played, but our motto is “If you can play the piano, please do, if you can’t, please don’t” ☺ - you will also find quite a few books here in the hall, as well as on the mezzanine and on the 1st floor too. NB! If the weather is really bad, breakfast will be served indoors in our dining area. ​NB! Also if there is a storm coming, we will have to unplug the Wi-Fi. Our old house is not suitable for children. We do not accept pets (we have a very friendly young Golden Retriever). Our house has a no-smoking policy. Parking is in the streets or village car park max 2min walk away. Breakfast and tourist tax incl. Minumum stay is 2 nights. Payment options: Cash, cheques in Euros and bank transfer. We do not accept credit cards! A deposit of 50% (the deposit is non-refundable if you cancel 4 weeks or less before your arrival) must be in our bank account or with us by post no later than 4 days after booking the room by email or the booking will be cancelled. Remainder to be paid on arrival. NB! Check-in time is between 16.00-19.00 - unless a different arrival time has been agreed in advance by email, we would still need to know your ETA (estimated time of arrival)! 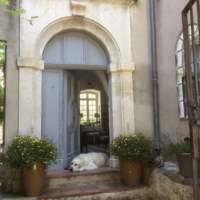 Our house is only a 4-5min walk from the park of Château de la Florans, which each July and August is host to the big music festival (in its 39th year in 2019) www.festival-piano.com . Also in July, a couple weekends before the famous music festival starts, the La Roque Festival takes place in the village www.countryroque.asso.fr it’s all about country western music, cowboy boots and hats, line dancing, Harley Davidsons and more, some big old American cars and a lot of tex-mex! Marseille Airport (Marignane) is 40min away, Aix-en-Provence TGV 35min, Avignon Airport (Caumont) 40min, Avignon TGV station 50min, Nimes Aiport 1H15min, Toulon-Hyères Airport is 1H30min and Nice Airport is 1H55min away. 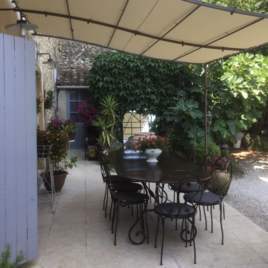 We are 30min from Aix-en-Provence, 40min from Avignon and the beautiful villages Lourmarin and Cucuron are less than 15min away. The beautiful villages Bonnieux, Goult, Lacoste, Ménèrbes and Gordes are only 30-40min away, as are so many other lovely villages. There is a wonderful Provençal morning market every day to visit, and there are also some markets in the evenings during the summer season. If you like to play a bit of golf, the stunning Pont Royal Golf Course is less than 10min away with wonderful views towards the Luberon and the Alpilles mountains. We have a lot of local and not so local information for our guests, and we are also happy to book restaurants for our guests. NB! If you look under the section ‘Access’ you can see where we are!